We've added new designs. These custom political emery boards are 4-5/8" x 1/2". The imprint area on each emery board is 2-1/2" wide by 3/8" high. You can print up to 3 lines of text; however, 2 lines are recommended. Blue is only imprint color for your political message available with these Republican, Democrat and Flag designs. We also offer patriotic emery boards in a red, white and blue design and stars and stripes design. Click here to see our personalized patriotic emery board. A customized emery board may be referred to as a finger nail file board, works as a great substitute for a custom made business card. 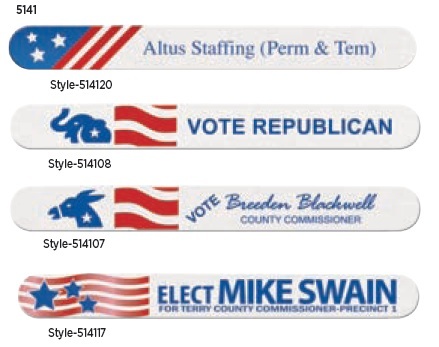 A customized political emery board with your political message can be a great asset to your political campaign and leave a lasting impression on voters.